Rocket Spanish Review - Does it work? Rocket Spanish is an online Spanish course by Rocket Languages. It's the biggest selling course in the Rocket Languages lineup — particularly popular for folks wanting casual, conversational Latin American Spanish. The idea behind Rocket Spanish is that it supposedly focuses on the most useful grammar and vocabulary first, rather than bogging you down with stuff you don't need to begin with. For instance, they say that if you don't know the word for "pencil" you can point to a pencil and ask a Spanish speaker, "how do you say this?" But if you don't know how to say "how do you say this?" then you're not going to get very far. So the focus isn't so much on learning endless vocabulary, but on learning the building blocks so you can be functional in Spanish faster. 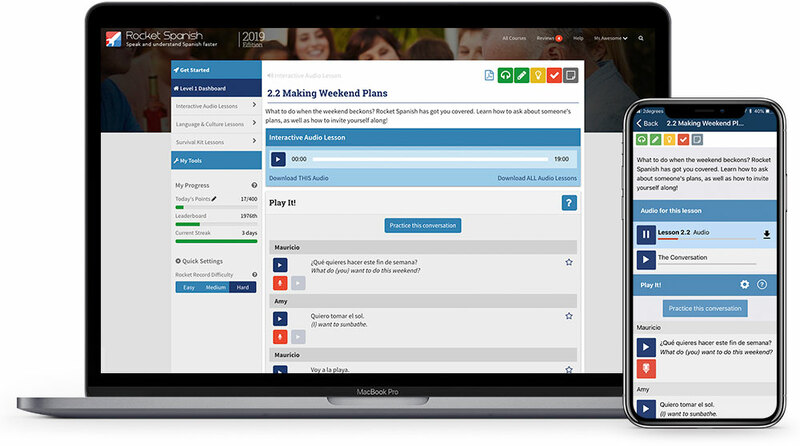 Later lessons and levels allow you to dig down deeper. Rocket Spanish doesn't quite have the profile of big players like Rosetta Stone, and it isn't quite as flashy as Fluenz or Duolingo. So how does it stack up? The thing with audio courses is that they always teach you how to book a hotel room. It drives me nuts. Everybody does that online now anyway. So I was quite pleased to find that one of the very first interactive audio lessons in Rocket Spanish taught me how to order a coffee. Thanks Rocket Spanish, that's 100 times more useful in my day-to-day life. There are 31 interactive audio lessons, averaging around 20 minutes each. Each lesson is structured around a conversation. The two hosts play it out, and then break it down for you to explain the meaning and practice the pronunciation. Rocket Spanish interactive audio lesson. Each lesson is around 20 minutes of audio, with additional exercises and transcripts available online or through the app. The conversations start off quite basic — introductions and “pleased to meet you”s — but then they start to get less ordinary. Winning the Academy Award for "most realistic language course dialog", by the end of module 7 the two hosts are arguing over whose job it is to clean the bathroom. If you want realistic conversations, I'm pretty sure I had this exact conversation last weekend. Each lesson covers a bunch of grammar and vocabulary, and during the lesson the two hosts will go off on tangents and explain how this is similar to that, and why you need to be careful about that other thing. For me, learning the grammar and vocab in context like this seems a lot easier and more natural. I found it quite impressive how much I learned just from these lessons, without even needing to dip into the other component of Rocket Spanish — the "Language and Culture" lessons. 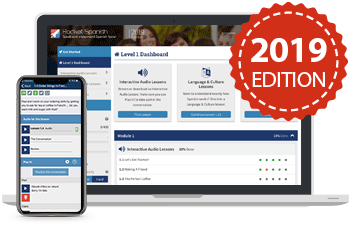 I would go so far as to say that if you're heading on vacation and you just need some survival Spanish, the audio course might be all you need. But if you're wanting to work towards full proficiency, you'll need something that goes into a bit more depth. This is more like a traditional classroom Spanish course, but with more technology and audio built in. The lessons are written (rather than audio lessons), with a lot of slow and clear audio examples. They do a good job of explaining the grammar points in plain English, and there's plenty of conversation practice, vocabulary, cultural discussion and quizzes to keep you interested. Tip: The course is divided into modules, and each module starts with a few interactive audio lessons, followed by these "language and culture" lessons. Rocket Spanish doesn't force you to complete lessons before you move onto the next, so you can hop around. But I strongly recommend that you do actually go through the Interactive Audio courses before you jump into the grammar lessons. I found that the Interactive Audio lessons gently introduced me to so much grammar that when I came to do the "language and culture" lessons, it already seemed familiar. The grammar section of the course goes into more detail and teaches you the building blocks of Spanish. 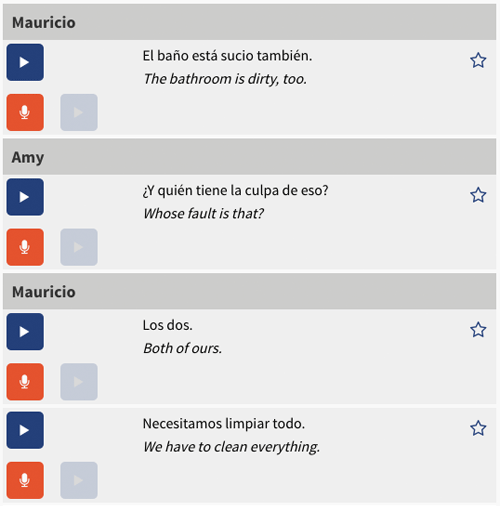 Rocket Spanish comes with a pretty good collection of practice exercises to make sure you've mastered the material from all angles: Reading, writing, listening, speaking, and being able to find the right words when you're under pressure! These tests use spaced repetition and keep presenting you with the stuff you've been tripping up on until you master it completely. One of my biggest weaknesses when learning a language is moving too fast through the material and not actually learning it properly. I've found these exercises challenge me to slow down and really learn the material, and my recall and confidence is better. You get a flashcard game for every module, along with a bunch of other games and interactive exercises to reinforce your learning. You can also create your own flashcards. One of my biggest fears when learning a new language is that nobody will understand me. It's kind of a problem when you're teaching yourself and you don't have access to a tutor or classmates to give you feedback. It uses voice recognition technology to check whether a Spanish speaker would actually understand you. It's similar technology to the voice recognition technology that your smartphone uses when you give it voice commands — except imagine your smartphone only speaks Spanish. When you finish speaking, it will give you a score out of 100, and highlight the parts that you got wrong, or that it didn't understand. I found this worked quite well — either my pronunciation is awesome, or the tool is quite generous. In either case, it was a pretty good boost to my confidence. How good is your pronunciation? Green means you've been understood by the Spanish-speaking tech, and red means you need to work on it. Who is Rocket Spanish suitable for? Anyone who wants a quick and easy introduction: Especially if you're heading on vacation, or you just want to learn Spanish for enjoyment... The interactive audio lessons are excellent and enjoyable. You can take them anywhere and they'll teach you a lot more than you'd expect. If you're taking a Spanish class who wants an extra study aid: The "language and culture" lessons are similar to a traditional classroom Spanish course, so would be great to use alongside. The audio examples, voice recording tools and testing tools would be particularly helpful. Older kids and teens: The games and testing tools would be good for keeping kids and teens engaged. Latin American Spanish vs European Spanish — is this a problem? Rocket Spanish teaches Latin American Spanish, as opposed to the Spanish spoken in Spain. The difference is similar to the difference between British English and American English. If anything, Latin American Spanish is just a little more "polite". Just like English speakers can understand other kinds of English, speakers of European Spanish can understand Latin American Spanish just fine, and vice versa. You can still use Rocket Spanish if you're looking to visit Europe or other Spanish-speaking parts of the world. It gets understanding and speaking Spanish fast: If you're going on vacation and you only have time to go through the interactive audio lessons, you'll still be miles ahead of most tourists. It's good for different learning styles: You might be good with audio lessons, or you might learn best by seeing things written down, or by playing games and doing tests. Rocket Spanish presents the information in so many different ways, you'll find something that works for you. It's entertaining, friendly and engaging: There's a sense of humor in Rocket Spanish, and it makes it easier to swallow the more boring parts of learning a language. There's an app for iOS and Android so you can do the entire course from your smartphone or tablet. The interactive audio lessons can be downloaded and played offline, so you can work on your Spanish when you're on the go. No software to install. It's an online course, so you just go to their website, log in, and it all works. No need to muck around installing things. Super reasonably priced: At the time of writing this, you can get the first level for under a hundred bucks. That gets you 31 interactive audio lessons, 33 language and culture lessons, 2666 voice comparison phrases and the full suite of testing tools. That is a LOT of material, and it will take you a long way towards proficiency. If you're after value for money, this is for you. Free updates and no monthly fees: You don't have to pay for updates, and it's a one-off purchase: There are no ongoing charges. This means it can make a nice gift too! 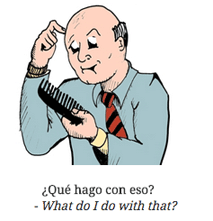 There's a bit of wry humor throughout Rocket Spanish. Not available in stores: You have to buy it through the Rocket Languages website. I don't really see this as a downside, but some people might prefer to buy a physical boxed copy. UPDATE: Rocket Spanish is now selling through Amazon.com, although you actually only receive a slip of paper with your access details on it (no CDs or DVDs). So you're better off buying directly through Rocket Languages — you'll get instant access and save yourself the shipping cost. When it comes to delivering a whole lot of learning and enjoyment for not all that much money, Rocket Spanish does a great job. The audio course is fantastic for building confidence. The language and culture lessons do a good job of explaining things in more detail, and the testing tools are great for getting that knowledge into your head. Rocket Spanish is especially good at getting results quickly because it focuses on giving you the important and essential language first. If you're heading to a Spanish-speaking country and you need a quick induction, you'll appreciate how quick this is. When you consider the number of tools you get, the effectiveness of the material and the low cost, Rocket Spanish is probably one of the best value interactive Spanish courses on the market at the moment. Gold star for you, Rocket Spanish!